Product #6101 | SKU 3251H00010 | 0.0 (no ratings yet) Thanks for your rating! The AKG Perception Wireless Vocal Set - Frequency A / 530 - 560 MHz is intended as an affordable wireless handheld microphone package, well suited for DJs, presenters, singers and more. 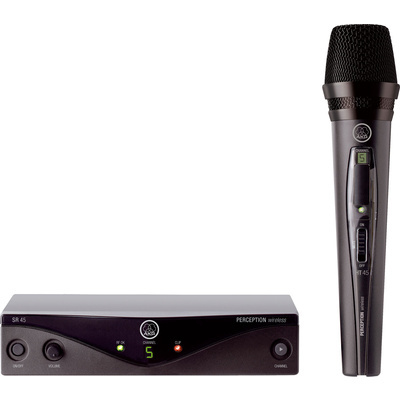 The system includes the SR 45 wireless receiver and HT 45 handheld microphone. The HT 45 is lightweight and features a 3-way on/off/mute switch. Simply power the microphone transmitter and receiver, choose between one of the 8 available UHF frequencies, and you're ready for wireless vocals. The compact HT 45 is powered with a single AA battery for up to 8 hours.